Cut a three inch length of cucumber and coarsely chop (set remaining cucumber aside to make cucumber ribbons). Place the chopped cucumber in cocktail shaker and muddle vigorously. Add the tequila to the cocktail shaker, shake for a minute or so and set aside (no ice is needed). Pour water and limeade concentrate into a small saucepan and sprinkle with the gelatin. Allow the gelatin to soak for a minute or two. Heat over very low heat until gelatin is dissolved, stirring constantly, about 5 minutes. Remove from heat. Strain the tequila mixture, and stir into gelatin mixture along with the Cointreau. Pour mixture into loaf pan. Place in refrigerator to set (several hours or overnight). To serve, cut into squares, and if desired, tie each with a cucumber ribbon (see below for instructions). Mix the ingredients for cayenne sprinkle and serve along side, for dipping. To make the cucumber ribbons, peel the length of the remaining cucumber with a vegetable peeler. Try to get mostly the light green fleshy part, with just a smidge of the dark green peel along the edge for contast. Trim ends to desired length. Cucumber Lime Margarita is one of my absolute all-time favorite jelly shot recipes. The recipe came about last year, when Jelly Shot Test Kitchen put out a call for our readers’ favorite end-of-summer cocktails. We had many wonderful nominations: including the French 75, the Paloma, and a Cucumber Lime Margarita recipe forwarded by our Uncle Al from Three Many Cooks (check out Three Many Cooks fantastic website for the liquid cocktail version, as well as an abundance of other delights). This recipe is one instance where the liquid recipe doesn’t translate directly into the jelly shot version of the cocktail. The Three Many Cooks cocktail recipe includes cucumber puree, which we adore. However, strangely and most unfortunately, cucumber is a flavor that becomes about 600 times as strong when gelatinized (and bitter to boot - yikes!). We make do with a little muddled cuke in our jelly shot rendition – the result is still fresh and flavorful, with just the right amount of “cool as a cuke” flavor. Cayenne Sprinkle (used to rim the glasses in the liquid cocktail recipe) is served on the side. We find that it adds a subtle kick, as well as a salted-rim authenticity, to this margarita jelly shot. 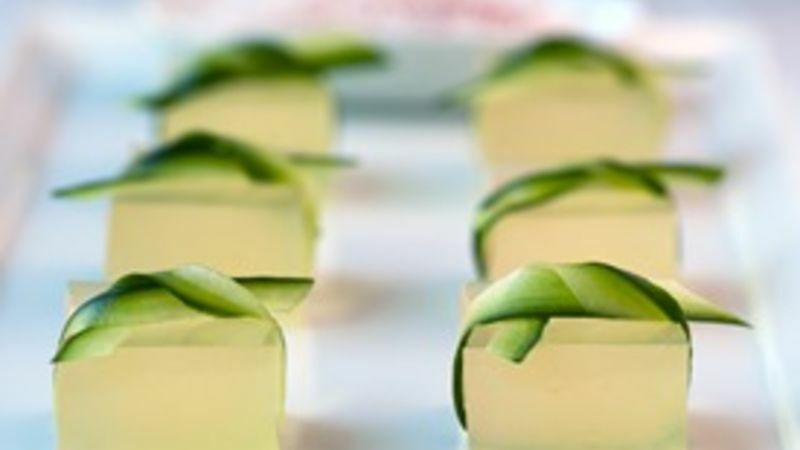 Hope you enjoy a Cucumber Lime Margarita Jelly Shot at your next summer soirée!